The matched quad of the Mullard CV491 Long Plates cost me a small fortune. They sound great and were the seated “incumbents” in my reference system. It was time to stop enjoying for a second and get into some serious listening with two other great tubes: the CBS-Hytron 5814 and Westinghouse 12au7 Carbon Plates. We all know the Mullards are on the darker side, colored, smooth, liquid, huge soundstage, thundering bass, a rich mid-range, with fast and powerful dynamics. So what is there to not love about them? Why even take them out? Well, it was just curiosity. Back in went the Westinghouse tubes. The amount of articulation and detail increased dramatically. The female voice became vivid and alive. It soared vertically. Strings on the violin were so detailed and vibrant, it was incredible. Overall things were brighter, but in a good way. They made the Mullards sound, can I say? Bloated? Definition and depth increased, although liquidity decreased. The downside was there was less overall soundstage (and less “torque” and drive). We didn’t feel as immersed in the music with the Westinghouse as we did with the Mullards. But even with that. Even with the loss of liquidity as well, we both thought the Westinghouse tubes were delivering superior sound and putting on a more pleasing presentation. Ok, so what about these famous CBS tubes everybody raves about? In they went. The tone was smack in the middle of the Westinghouse and Mullards – the CBS seemed the most “middle of the road” of the three. A smooth, even-toned, balanced sound. Plenty of soundstage. It’s almost like a perfect tube. The model citizen, or blue ribbon winner dog. They wake up, do everything right, and even add a touch of sweetness along the way. The downside? They might be missing a bit of personality compared to the other two. No wow factor. No flaws in presentation, but maybe just bit “ehh”. The Westinghouse tubes won this tube roll. They are super musical, they have zip, and the soundstage has dimension and is very entertaining. The only real downside with the Mullards is the “veil” they put over the vocals. The CBS tubes have no technical flaws, but lack just a bit of flair. So with that, the Westinghouse tubes are back in and I’m listening to them right now. 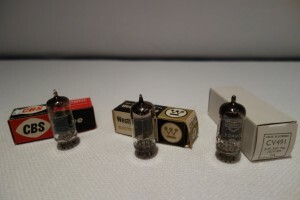 There are three tube-types on the way: 1) Amperex Bugle Boy Long Plate D Foil (1958 Holland), 2) Westinghouse 12bh7’s, and 3) GE 6189 Black Plates. Things are getting interesting…and thanks to Nikolay for pointing things in the right direction with this great website. This entry was posted in Vacuum Tubes and tagged 12au7/ECC82, CBS-Hytron, Mullard, Westinghouse by jsch123. Bookmark the permalink.